Spy Shot Supposedly Depicts iPhone Nano | OhGizmo! I love my iPhone 3G, but I will admit that it was a pricey investment. There have been rumors flying around about price drops and even a smaller version of the phone for some time now. Well with Macworld coming up next month, the rumors are really heating up. The most interesting thing I’ve seen is this supposed spy shot of a new iPhone Nano. The picture looks convincing enough, and reminds me of something I’d expect to see projected on a giant screen behind Steve Jobs (even though he won’t actually be giving his usual keynote speech this year). 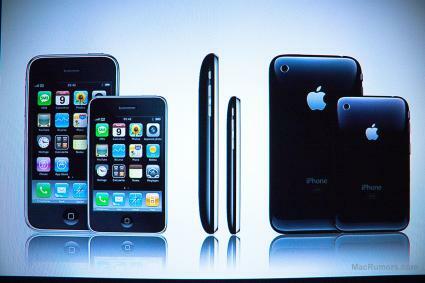 Granted, it does look like they simply scaled-down the image of the iPhone 3G and adjusted the screen to fit. Also, I wonder just how well the current apps would work on a smaller screen. What do you guys think, would you pay a lesser price for a smaller iPhone? I like the full sized one myself. Totally shopped. The reflections are all wrong. The photos are convincing ? I don't see anything but a downsized iPhone. And what makes me suspicious is that the button is ALSO downsized. This is then for the 70%-size crowd with smaller fingers ?? Did they maybe also downsize the bytes to 7 bits ?